A Forex Trader Mom: Fear keeps me out of pips. Non-Farm didn't work too well for me last Friday. For the last 2 days, I have been trading defensively trying to get the account back to where I was pre-Non-Farm. 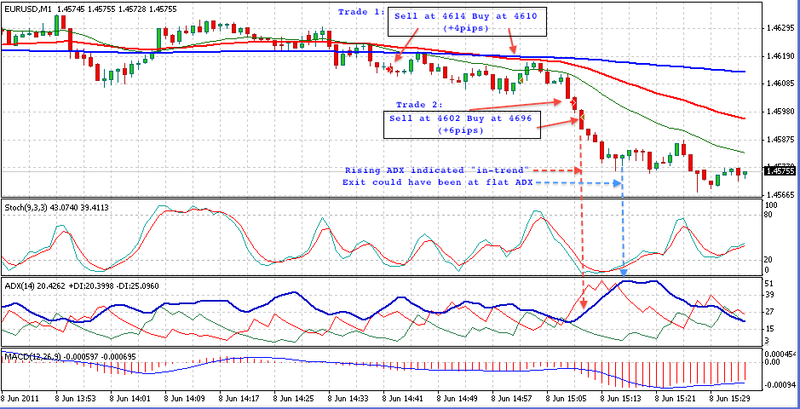 I am also working at trading in the direction of the trend for the day. Back to basics by looking at points of support and resistance in the smaller timeframe charts. Today's trades brought in 10pips - average daily target achieved for the day but in typical greedy trader form, I think I could have done more. 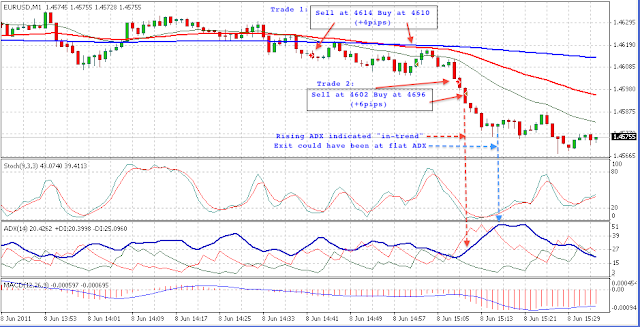 A quick view of the charts showed downtrend since Asian session. 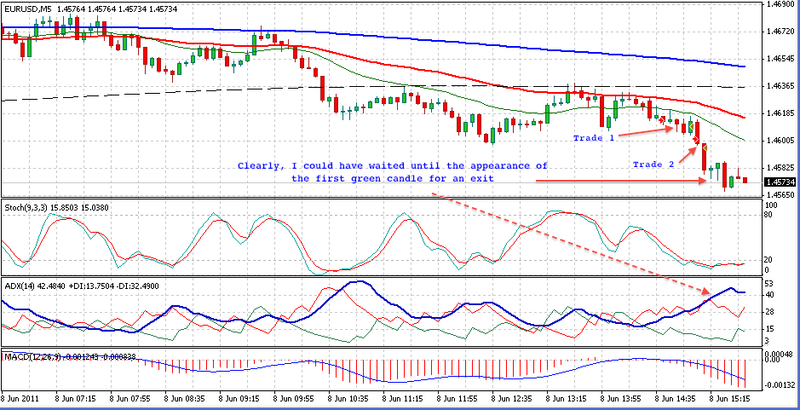 On 1min chart, $EURUSD has been bouncing down from resistance at EMA62 and SMA200. Both trades were Sells. Started Trade 1 (4614 to 4610 for +4pips) at 14:42GMT, exited at 15:01GMT. Trade 2 (4602 to 4596 for +6pips) entry at 15:09GMT exit at 15:10GMT. I usually expect $EURUSD to trade in the direction of the day until half hour before London close when it gets choppy. This was a safer time since there was no more news for the day since it was just after announcement of US Crude Oil Inventories. It's obvious from the 5min chart that I could have waited for the pullback in Trade 2 to exit instead of prematurely pulling back before the end of that 5minute candle. 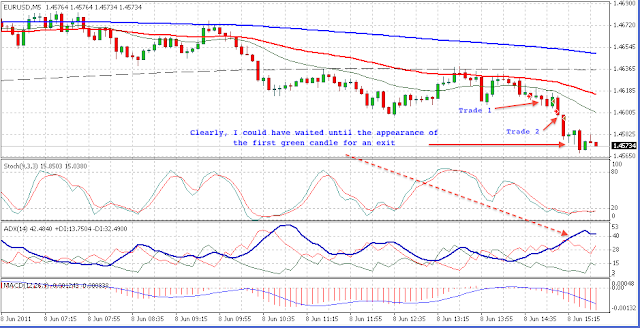 The 1min chart ADX was rising, which meant that I could have held on until the red line crossed the signal line. I know I didn't check this before exiting and if I did, my brain could have somehow ignored this. I remember thinking I was "feeling the Fear" since there was a pullback 3 hours ago at 4598. So when it broke past the 00 level, I was waiting "fearfully" for a pullback. Even thought the pullback didn't happen, I pulled the trigger and killed the trade in its track. Next time I might have to sit a little bit further back from the screen and maybe breathe a little bit more.